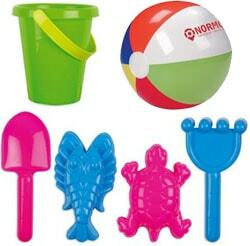 Promotional Summer Ideas For a Day Out at The Beach! Although there are many health benefits of being out in the sun (vitamin D), there is also the danger of sunburn and dehydration. 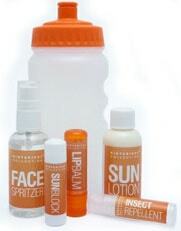 Show your customers you care, and use this beach travel set to promote your brand this summer. Drinking more water will keep your customers hydrated and drinking water with your branded water bottle which will keep your logo visible and remind your customers to get back in touch with you! This pack also includes personalised suntan lotion as well as lip balm and insect repellent, helping to keep your customers safe. Looking for a more unique shape lipbalm to show off your logo? Head over to our YouTube channel to see our innovative pocket sliding lipbalms in action! You wouldn’t go to the beach without your trusty flip flops. Imagine how many people will see your brand bobbing along with that brightly coloured footwear. 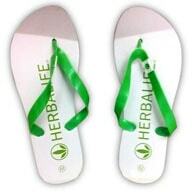 This can be branded to the base of the flip-flop or to the strap. Our promotional flip-flops come in a number of bright colours to suit your logo and it has a low minimum order quantity of only 50. Although some might use their sunglasses in the winter when the sun is low, there is no denying they get the most use during those summer months. When you get to the beach, everyone will have their shades on! Let’s make the most out of branding your logo to these fabulous accessories while we can. Let’s have some fun we bet you know at least one person who loves to wear a wacky hat when they go to the beach (Mum comes to mind). This is a perfect way to promote your company and bring some fun into your next promotional marketing campaign by branding that weird and wonderful hat and really making your company shine. Let’s not forget the children (or those adults pretending to be children). These beach balls come in two different sizes and have a large print area for your company logo. We have many other beach items, please let us know if you require any assistance. We are happy to provide visuals of products with your logo, quotes as well as samples. This unique product is a great company giveaway and would be perfect for a direct mail campaign as they are small and lightweight to send. Customers can simply plug the fan into a phone or other compatible device and enjoy a cool breeze while they browse products on your website! These can be printed 1 colour to the propeller. Don’t forget that one item everyone will bring with them to the beach... Promotional beach towels have a very large branding area over the whole towel for that impact you won’t forget in a hurry. This is the sort of promo gift that your creative artwork team will get really excited about – lots of freedom to go to town on this one! Cleansand beach ash trays are a great eco-friendly promotional product idea, helping to prevent individuals from dropping their cigarette butts on the floor - no ifs, no butts! Did you know that over 6 million cigarette butts are dropped on the streets of London alone every year and we spend almost £4 million cleaning it up? This can have extremely negative effects on wildlife and sealife, and as this is a criminal offence individuals caught littering could recieve a fine (City of London). 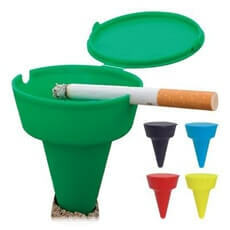 So why not show your customers that you care about the environment with these nifty portable beach smoking accessories? Print with your logo for maximum impact. Our minimum Quantity for these is 500 units.